The sky is a little dimmer tonight. The stars don’t seem to shine so brightly. The world is a little bit greyer. There are only three instances of which I can recall, when I’ve watched the news with my mouth dropping open with shock. The death of Princess Diana was one of them. The terrorist attacks of September 11 were another. This morning, sadly, another of those moments were added to my memory – when I turned on the news and heard about the death of Robin Williams. Tears filled my eyes, when I heard the sad news. The world has lost a truly great talent. There’s a fine line between brilliance and lunacy, and Robin Williams straddled that line for most of my formative years. My first memories of Robin Williams were on the zany, madcap ‘Mork and Mindy’ He was one of my first crushes, when the show began in 1978 and I was thirteen. I thought he was the coolest guy ever. I loved his fashion sense. Who can forget his struggles, coming to terms with the Earth after arriving to study the planet? 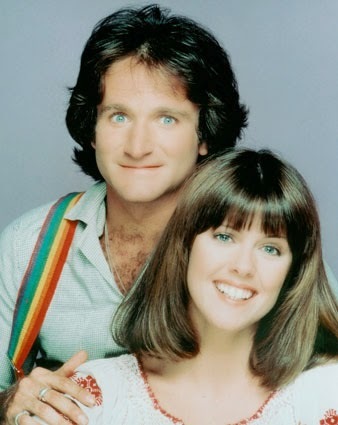 And hats off and kudos to Pam Dawber – how she ever managed to keep her ‘Mindy’ face straight, dealing with Robin’s ‘Mork’, I will never know. As I grew up, Robin Williams brilliance grew. His comedic abilities were never to be questioned, he was truly one of the funniest men I’ve ever seen. But his acting ability was only to move from strength to strength as the years passed. 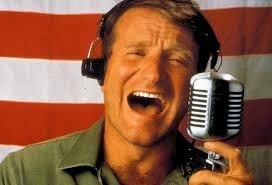 Throughout the eighties, as I left childhood and entered adulthood, Robin was there, making movies and making me laugh. From ‘Moscow on the Hudson’, to ‘Good Morning, Vietnam’ (which remains one of my all time favorites), and on to ‘Dead Poet’s Society’, his star grew and grew. In the nineties, he entertained with ‘Hook’, ‘Toy’s’ and ‘Mrs. Doubtfire’. I adored ‘The Birdcage’, which got a run in our house again with the next generation, when my son was in a play and needed to be an over-the-top gay man. ‘The Birdcage’ fit the bill to a tee, and a new generation of fans were born. 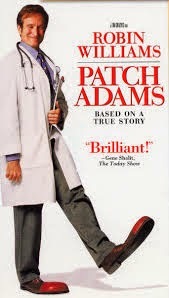 We watched him continue to master his craft, in ‘Good Will Hunting’ and who can possibly forget ‘Patch Adams’ He could make us laugh, he could equally make us cry. ‘Bicentennial Man’ was another of my favorites. With the new millenium, Robin Williams continued to entertain. Not only appearing in movies, such as ‘One Hour Photo’ and ‘Night at the Museum’, but his voice could be heard on so many soundtracks. He was the voice of Fender in Cars; he was the voice of ‘Ramon and Lovelace’ in ‘Happy Feet’ and who can forget his turn as ‘Genie’ in ‘Aladdin’? And tonight, the world mourns his loss. It’s no secret he’d suffered from depression and addiction throughout the years. It’s no surprise he harbored thoughts of suicide. The true tragedy, is that such a talented, funny and wonderful man could decide to end his own life, apparently unaware of how much the world truly adored him. Vale, Robin Williams. And may you find peace on the other side. Sometimes being the funniest and greatest actor doesnt make you the happiest. You voiced my feelings, spot on. Beautifully written!